Social Media Missteps: Is it okay for brands to swear? As a consultant, I help my clients navigate the array of proliferating new social media opportunities and establish a presence that builds brand affinity and relationship. So, I'm always looking for examples -- good and bad -- of how brands are using social media. "wholefoods TOTD: @Joanmarie Oh my f'ing gawd: Whole Foods has Hatch Chiles. From NM. On sale. Apparently I have died, but am not as evil as I thought." Now, I have my personal opinions about this tweet -- and I realize they're personal. I just thought it was reasonable to pose the question of whether or not it's acceptable for your trusted brands to be saying things like "Oh my f'ing gawd" in the public social media channels that you -- and your family -- follow. As a corporation, it may not be adviseable to talk to your social network the same way you'd talk to the guys in the locker room, a friend over coffee, or your posse over beers. To many people - especially those with families or who are religious, this statement might be highly offensive. The lesson here is a simple one. Every social media manager today must remember that, to your followers, you ARE the brand. Our own personal values (language, personality, culture and preferences) will not always align with brand values, which is why it's necessary to think twice and conduct frequent reality checks. Unfortunately, when we screw up in a Social Media channel and misrepresent the brand, we instantly broadcast to our collective of followers... and vicariously to their networks. As a result, our messages can then be taken downstream quickly in the current cross-channel chatter.... resulting in things like this little post. "Oops, I'm sorry. Perhaps I shouldn't have used that term. I just LOOOOVE Hatch Chiles and got too excited! It won't happen again!" "Oops. This was a retweet of someone's post for our 'Tweet of the Day' and I didn't mean to offend anyone. Please accept my apologies." (I added this when I realized what TOTD meant). I did a similar thing once, when I inadvertently posted a comment to Twitter that someone had sent me via IM, which contained "the s word." Instant ownership and apology when necessary! While I waited for a response, I did get some direct and open messages from good number of people expressing their opinion about the tweet .... and all of them thought @wholefoods' comment within that post was a misstep. This is a great example, not just for Whole Foods, but for anyone leading social media within corporate environments today. When you tweet, plurk, blog, feed, utter, or other in social media YOU ARE THE BRAND! Therefore, it's always a good idea to edit yourself based on your brand's values, rather than your own. Last night before "meet the teacher" night at my daughter's school, we took the family to Ruby Tuesday. I hadn't been there in awhile. As we waited for our waiter, one of the things that jumped out at me on the table was a tent card, which listed featured drinks. 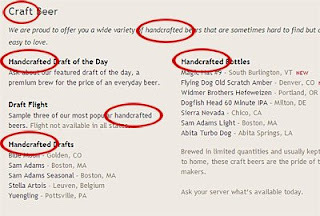 The first item was a "Handcrafted Drafts". "Funny....I thought... handcrafted? Since when is Sam Adams hard to find, and made by hand?" Thus began the jokes, as we sat at our "handcrafted table" looking at our "handcrafted menus" and "hand-crafted" napkin/utensil set... Our chuckling increased after the waiter offered to take our drink orders and suggested a handcrafted drink. It was all pretty kinda silly! We understand that people may confuse you with Applebees. We understand that you do not want to be viewed as "fast food", but rather "Simple Fresh American Dining." We also understand that, to the extent you can change these market perceptions, you can up your price to $10 for a burger and $15 for a steak. We aren't dummies, so please do not insult our intelligence or attempt to brainwash us with far-reaching marketing copy. ...And please do find a thesaurus! The truth is this: No matter how much we spend on getting our copy nailed (and a lot of Ruby's copy is written quite well), it's still the window dressing of the experience. When we go too far with copy and over bill the brand, we find ourselves teetering on the edge of ridiculous! Selecting words is important. Personally, when I think of the word "handcrafted", I think of my brother-in-law, who is a carpenter and a true craftsman. I think of my husband, who builds truly hand-constructed engines that go very, very fast. I also think of Etsy, a site that sells handmade items that are truly unique and special. When I think of handcrafted, I also think of one of my small, local clients, Rug & Relic (link forthcoming, site in development). This client is a combination of an art gallery, a showroom for totally exquisite rugs a hand an import house for fascinating Turkish antiques. Everything they sell is totally unique...from handmade bird houses that were used to keep Partridges, to huge hand-carved wooden yogurt churns, designed to swing from trees. I love listening to the owners tell the unique story of each individual piece. They've got gigantic, hand-thrown ceramic vases that are hundreds of years old, sitting upon hand-wrought iron stands, and hand-hammered antique copper cauldrons big enough to bathe in. From the art to the custom-made lighting....everything they sell is truly hand-constructed. Because most of it is recycled, it's also green. The place is just cool! 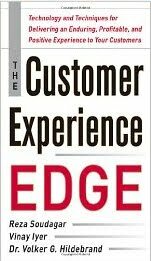 With Rug & Relic, the product, the interface, the customer interaction drive the experience. They never over bill themselves ... they are driven by word-of-mouth, and they don't mind being an exclusive, best-kept secret. Their customers are their greatest evangelists. Going back to Ruby's... I think it's very possible to find new language and still communicate a message of craftsmanship without wearing it out. Our experience was otherwise good. My turkey burger was great. The service was very good, and the environment was pleasant. The experience was solid enough to stand on its own without the marketeers pounding us with over-reaching messages. Like I've said before. Sometimes it's just better not to push things too far.